Eighteenth-century consumers in Britain, living in an increasingly globalised world, were infatuated with exotic Chinese and Chinese-styled goods, art and decorative objects. However, they were also often troubled by the alien aesthetic sensibility these goods embodied. This ambivalence figures centrally in the period's experience of China and of contact with foreign countries and cultures more generally. 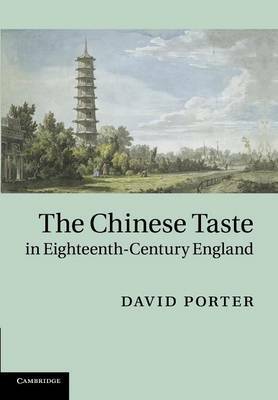 In this book, David Porter analyses the processes by which Chinese aesthetic ideas were assimilated within English culture. Through case studies of individual figures, including William Hogarth and Horace Walpole, and broader reflections on cross-cultural interaction, Porter's readings develop interpretations of eighteenth-century ideas of luxury, consumption, gender, taste and aesthetic nationalism. Illustrated with many examples of Chinese and Chinese-inspired objects and art, this is a major contribution to eighteenth-century cultural history and to the history of contact and exchange between China and the West.